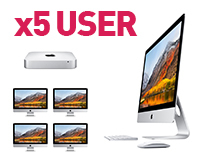 Our typical 5-user Apple iMac network is the perfect Apple leasing solution for small creative businesses. Microsoft Office for Mac 2016 or Office 365 can be added for all Macs as can printers and other peripherals. (We offer to lease storage solutions from Drobo, Seagate and Promise). Data is sent to the Seagate NAS in real time and a nightly back up of essential data is sent off-site. This data can be accessed remotely and the last fourteen days of data can be recovered. The Kerio Connect software is the Mac alternative to Microsoft Exchange and also offer Sophos Anti-Virus protection. If you are looking to expand or are even starting up, HardSoft have the right package for you! New and established companies will benefit from the same great deals which come at a much lower rate than a bank loan and do not have any hidden large arrangement fees. All Apple network leasing packages include everything to run your business with three years unlimited telephone and remote support by Apple Certified Technical Coordinators. 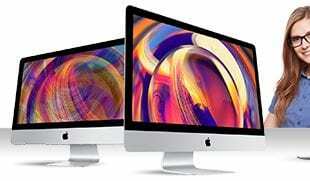 For enhanced support our Gold option includes a Loan Mac should yours need to be taken for repair. 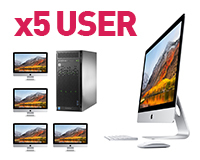 This five user Apple Mac Network utilises wireless connectivity but we do offer a CAT5 Cabling service that can be included in the lease costs. 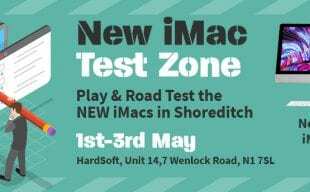 For more Apple Mac Network solutions then contact one of our Apple Product Professionals for advice on 0207 111 1643. We can arrange a bespoke package to fit all of your IT business needs with payments on a time frame to suit you. HardSoft have been trading for over 30 years. As a financial expert and an IT specialist, we are a one stop solution for all of your IT needs. As you only deal with us, they process to decide on the right technology for your business and a finance structure can all be decided with one easy call. If you need to claim on your warranty or need technical support, it can all be handled on the same number 0207 111 1643! Removing any middle man means that your get a much better deal and more for your money. Apple leasing is 100% tax efficient so makes great business sense. Hold on to your cash, an Apple lease can assist your company with cash flow but still update your IT or expand. As Apple leasing is a fixed monthly cost, the return on your investment can be easily measured and displayed to your shareholders/ directors. Do not get stuck with old, out of date IT, with our upgrade options you could change your lease after just 24 months.